I was a very early adopter of the Aeropress, I have been using one very nearly since their introduction. I would have bought it in mid to late 2006, and I have made hundreds of cups of coffee with it. In the picture you can see the measurement lines wearing off, even though it rarely goes in the dishwasher. Despite that early experience, I may be the last person around to review the Aeropress. 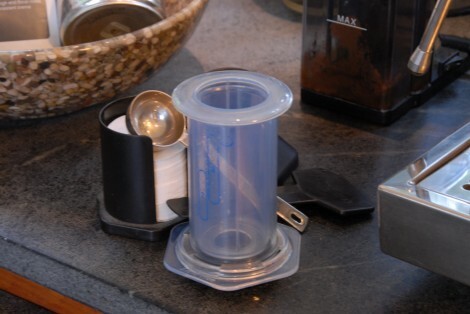 The Aeropress has not suffered from any lack of press. Since it’s introduction in 2006, food writers, coffee geeks, and a company of YouTube commenters have weighed in on it, generally very favorably. And there’s a reason why. The Aeropress makes good coffee. Really good coffee. It’s easy to use, inexpensive, and reasonably indestructible. It may not be the coolest looking coffee machine (that would be the Giotto Rocket), or the favorite of the purist (Chemex), or the most at home in a 50’s science lab (Vacuum pot) – but it makes great coffee anywhere and it’s pretty cheap. So, what’s not to love? Aside from the burning controversy. No, there’s no patent scuffle – everyone knows who invented it, Alan Adler. Nope, there’s no corporate scandal. Yes, it’s really coffee….But, upside down, or right side up? That question has launched thousands of heated arguments on YouTube. At the World Aeropress Championships (yes, there is such a thing), folks seem pretty happy with the upside down method. I’m sure they get great results. The idea is that by inverting the device, you can let the coffee steep longer. I like the idea of steeping the coffee for a minute or so, despite the fact that the coffee is already vigorously mixed with the hot water. I just don’t like the fussiness. I use my Aeropress a lot, and I’ve gotten sort of stuck in my ways – the ways which were printed on the instruction manual that came with it. Add coffee. Add water. Stir for 15 seconds. Press. Drink. Repeat until eyes open. I like that simplicity, and the coffee has always been pretty darn good. Plus, I have an instant hot water system so the whole brewing process for a cup of coffee is a couple of minutes at the most. But, I’ll try and keep an open mind as long as the comments are somewhat civil. As for the Aeropress? Yeah, you should get one. They are great for travel, great for home use if you only want to make one or two cups, great if you are drinking regular and your significant other is drinking decaf – they’re great. The only possible downside I see is that I end up using more coffee per cup than with drip brewing, but I’m not wasting any coffee either so I think it may even out.